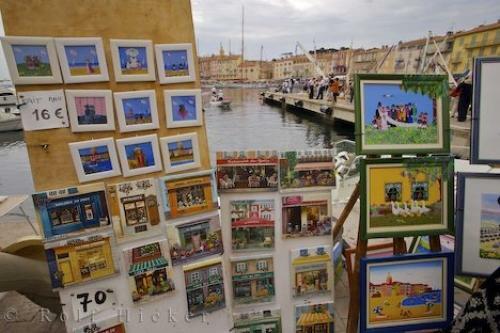 The local talent of the artists of Saint Tropez in Provence, France can be seen along the Quai Suffren in the Old Town where many visitors come to enjoy the beautiful scenery. Saint Tropez on the French Riviera in Provence, France, is an ideal place for local artists to show of their talents as many rich people come here to spend their millions of dollars. Saint Tropez becomes very crowded during the high season, but not nearly as bad as some of the other towns along the Cote d'Azur. The Quai Suffren is just one of the spots along the waterfront that the artwork is displayed.With the harbour as a backdrop, the paintings are shown to full advantage. The Quai Suffren is named for the local hero, Admiral Pierre Andre de Suffren de Saint Tropez, who lived from 1720 to 1788.Paintings by local artists along Quai Suffren in St Tropez, The Var, Provence, France, Europe. Photo of some of the talent which have been painted by the local artists of Saint Tropez in Provence, France in Europe.